Stockbridge Football Club was formed in 1894. The only institutions in Stockbridge with a longer history than the Club are the Courts Baron and Leet and the Churches. The club nicknamed “The Robins” played its early games on the Common Down before moving to Little Dean field in London Road in about 1910, a site provided by Sir Norman Hill, Lord of the Manor. Stockbridge was proud of its team then and always has been, for over the years it brought success to the village at regular intervals, often against clubs with far bigger populations and resources. Soon after the First World War, they won the Jorgenson Cup, a competition based on the King’s Somborne district, and during the 20s they won the Faber League Cup three times, and were three times champions of the Sutton Scotney League. They entered the Andover Junior League in 1931 and won the Division 2 championship at the first attempt. In 1933 the Robins won the Hants Junior B cup and in 1935 they won the North Hants Junior Cup for the first time. The club withdrew from the Andover League in 1936 and up to the outbreak of World War 2 competed in the Winchester League. After World War 2 Stockbridge again joined the Andover Junior League, winning the first division championship four times and the League Cup twice.The Robins also won the North Hants Junior Cup in 1955 and 1961.They were finalists in the Hants Junior ‘A’Cup in 1952, a big day in the Club’s history as they played at Portsmouth ground, Fratton Park. This part of the Club’s history came to an abrupt end in 1971 when Little Dean was taken from the club by Hampshire County Council for road improvements, dealing the club a near mortal blow, leaving the Robins a nearly impossible task of finding a new home. Rosalind Hill, now Lady of the Manor kindly donated the money from the sale of Little Dean to the Parish Council, however three years later the Parish Council had made little progress with the project. Consequently things looked extremely dire for the Club, who only survived this period thanks to a local Farmer John Foord, a real friend to the club who allowed them to play on one of his fields. During this period another person became a major player in the quest for a new pitch. Elizabeth Viney, a real sports lover, approached the Football Club and offered her help. Elizabeth enlisted the help of Hampshire Playing Fields Association, of which she was a member, and following much negotiation and many setbacks, in 1976 StockbridgeRecreation Trust, a Registered Charity was formed. The Parish Council put the money donated by Rosalind Hill into the Trust and a piece of landwas purchased for a new ground. Converting the piece of land, a peat bog, was going to be a major project – the site needed to be built up a considerable amount. The Football Club members organised numerous fund raising events to raise money, while at the same time Club Members spent hundreds of hours working on the site. The Vine Inn, headquarters of the Football Club at the time, raised well over £2000 as a result of a sponsored walk. In addition to this the Club received a grant from Hampshire Playing Fields Association, donations from Stockbridge and Longstock Parish Councils, Stockbridge Festival, Houghton Fishing Club and £500 from Jim Parker, an old Stockbridge player who was visiting from his new home in Australia. Also valuable donations of infill from Leckford Estate and yet again the tremendous work carried out on site by John Foord all resulted in the project taking shape. At the same time, a sub -committee demonstrating the same commitment,worked on the children’s play area. After seven long years the Recreation Ground opened in August 1978. At their new home the progress of the Robins would have filled their forerunners with pride. The playing surface has developed into one of the best in the county, used not only by the Football Club, but enjoyed by the local children and their parents for recreational activities.The team’srecordon the new pitch has been remarkable for such a small community. On the first full season on the new ground the Club were Andover League Champions, a feat they repeated in 1982. In 1984 the Robins were promoted to the North Hants Senior League. In their first season in this, they finished in 2nd place in the League and were Runner-Ups in the League Cup. 1988 saw Stockbridge reach new heights when they became North Hants League Champions. In 1989 the club won the Andover Open Cup, and in 1990 the Andover Midweek Cup. 1991 saw Stockbridge have its most successful year in its history, winning the North Hants Senior Open Cup, North Hants League Cup, Andover Open Cup, and the Andover Midweek Cup and in the same year the Robins were promoted to Hampshire League Division 3. In 1992 the Club again won the Andover Midweek Cup, andfinished in second spot the year after. 1994 saw Stockbridge promoted to Division 2 of the Hampshire League. 1998 was a proud year for the club when they were promoted to Division 1 of the Hampshire League. In 1999 the Robins again lifted the North Hants Senior Cup. The season 1999/2000 saw Stockbridge elected to the Premier Division of the Hampshire League. In order to comply with the Hampshire Leagues requirements, 2001 saw floodlights installed at the Recreation Ground, achieved by the same huge fundraising efforts by club members, and support from local organisations, businesses and individuals as in the past, plus grants from Sport Aid, Test Valley Borough Council, Stockbridge Parish Council, and Hampshire Playing Fields Association. 2004 saw the demise of the Hampshire League and we were placed in division 2 of the Wessex League. 2005 saw another first for the club when they reached the quarter -final 0f the Hampshire Senior Cup where they finaly went out to F.A. Vase winners Winchester City. The 2006/07 saw Stockbridge pick up another trophy, winning the AndoverOpen Cup for the second year running. Stockbridge beat Alresford Town in the final,who had just won promotion to the Sydenhams Wessex Premier division. 2008 saw Stockbridge faced with the possibility of expulsion from the Sydenhams Wessex League if they did not have a stand in place by the summer. A fund-raising committee was set up at the beginning of January and they set themselves the daunting task of raising the £10,000 needed for the stand by the end of March. Fund-raising events were organised and a public appeal was launched to try to reach the target. The response from right across the local community was amazing. Money poured in from local businesses, organisations and individuals and by the closing date of the Appeal at the end of March the staggering amount of £16,494 had been raised. Once again in their hour of need the community showed their support for their Football Club. The stand was put in place at the end of May and officially opened by the Lord of the Manor on June 7th. Stockbridge continued in the Wessex League and the season 2012/13 also sees the Club with an under 15’s team and an under 14’s team. The men’s team won the Andover Cup, the U14s won the Testway Cup for their age group and the U15′ s were runners up in their division. The winter floods of 2014 had a devastating effect on the Club. From January to March the pitch was totally flooded due to a nearby river breaking it’s banks. With no hope of completing their fixture the club had no option but to withdraw from the Wessex league. 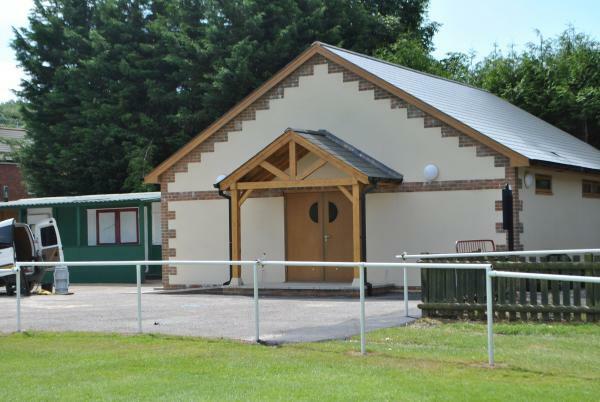 June 2014 saw the opening of the new state of the art pavilion at the Recreation Ground. Last Saturday saw the official opening of the new pavilion for Stockbridge Recreation Ground after many months of toil including through monsoon conditions at the start of the year. 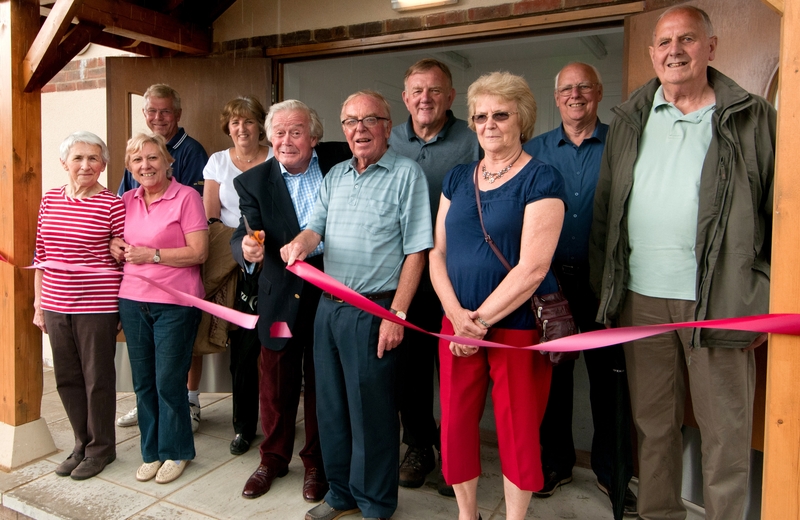 The pavilion was opened by lord of the manor Guy Boney QC and named the Dave Webb Community Pavilion in honour of Dave who was awarded an FA gold medal last year for 50 years service to Stockbridge FC. Also in attendance were seven other members who have silver medals for 25 years service. Sacha Nicholas, county development officer represented Hants FA alongside retiring chairman John Ward. The start of 2014/15 season saw Stockbridge placed in the Premier division of the Puma Hampshire league as decreed by the Football Association. After all the trials of the previous season the 2014-15 campaign saw Stockbridge picking up another trophy, winning the Andover Open cup. As Stockbridge continued to to play in the Hampshire League 2018 saw to major events. In June the new Club room and bar was opened after the conversion of the old changing rooms.The year also saw the club enter the F.A.Vase for the first time. They also become the only Hampshire League team to play in this competition.